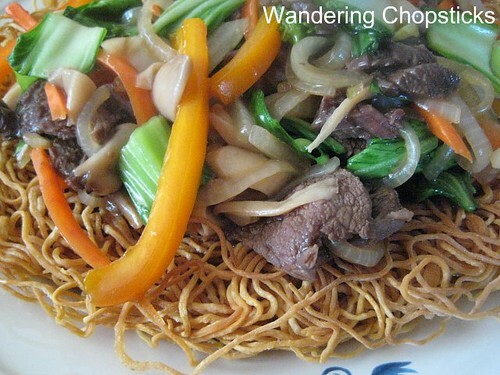 Ah, you've all been waiting so patiently for the beefy chow mein recipe. 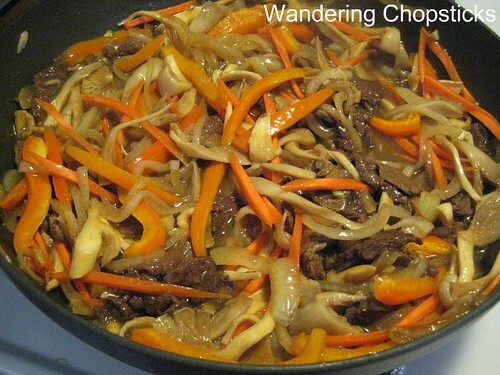 This version was made with beef, onions, bell peppers, bok choy, carrots, and oyster mushrooms. This was an earlier version with just beef, bok choy, and shiitake mushrooms. Thinly slice 1/4 lb or more beef. Marinate with 3 cloves minced garlic, 2 tblsp oyster sauce, 1 tblsp soy sauce, 1 tblsp corn starch, 1 tsp fish sauce, 1/2 tsp ground black pepper, and 1/2 tsp sugar. Mix thoroughly and set aside. Then dice and slice your choice of vegetables. 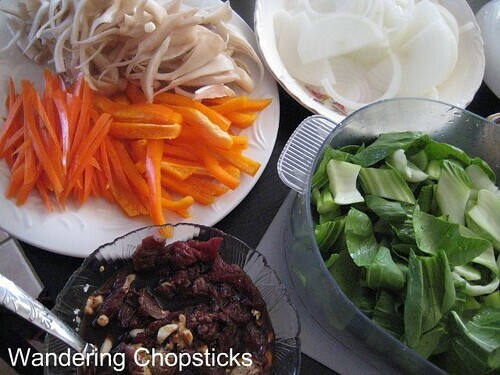 Starting from the top right, I have onions, baby bok choy, marinated beef, bell pepper, carrot, and oyster mushrooms. Set aside. 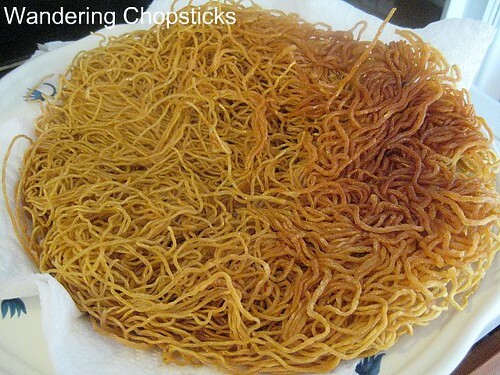 Chow mein noodles sometimes come in individual bundles, you'll need about two of them. Drizzle an even layer of oil to coat the bottom of a frying pan. Turn the heat to medium-high and when the oil is hot, quickly layer the noodles evenly on the pan. 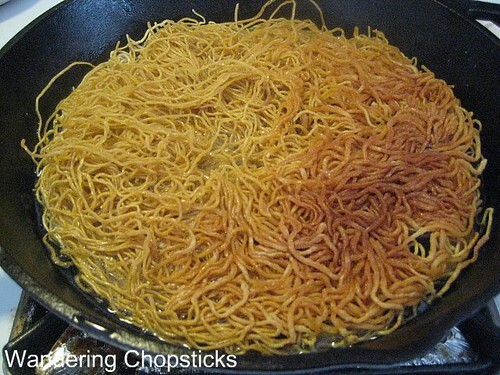 The noodles should stick together and be easy to flip when they turn golden. 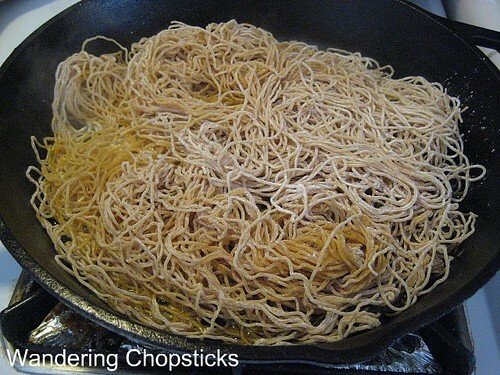 I have an old stove which heats unevenly so my pan-fried noodles are a bit uneven too. 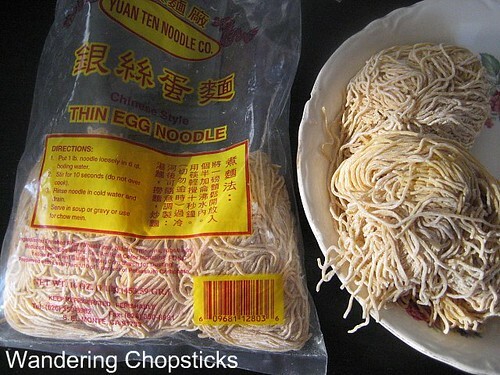 When the noodles are completely golden on both sides, set aside to drain. 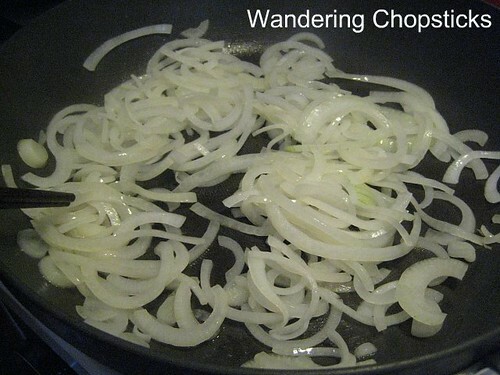 In a large saucepan or wok on high heat, drizzle a bit of oil and saute the onion slices. 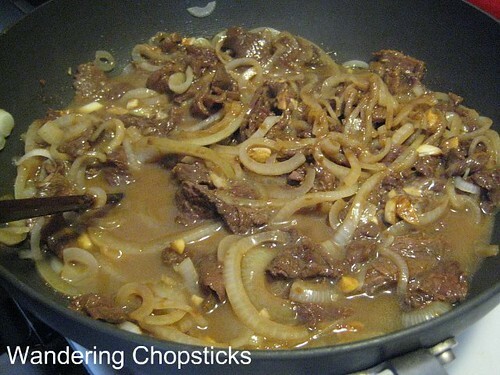 When the onions have softened, add the beef, reserving the marinade. Saute the mixture until the beef looks slightly charred, then add in the marinade. Add about 1/2 cup to 1 cup of water into the empty bowl so you get the last of the marinade, and add that to the pan as well. The corn starch will start thickening the beef mixture into a gravy. Add the mushrooms, carrot, and bell pepper and saute again. The mixture should start softening and thickening. Add the bok choy near the end so they don't get overcooked. 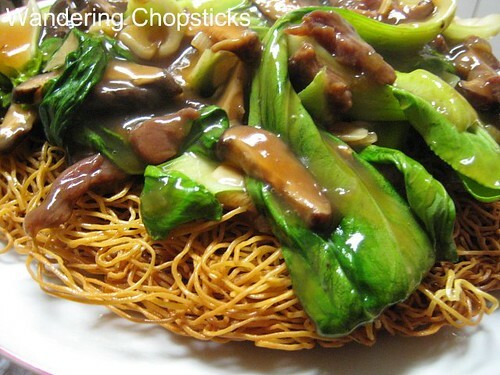 Place the crispy chow mein onto a deep plate that can handle extra gravy. 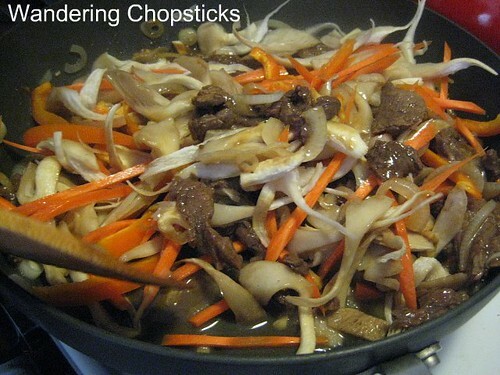 Pour the beef and vegetable mixture over the noodles, drizzling the gravy all over. I like the crispy parts. Lil' sis likes the beef gravy-soaked noodles. 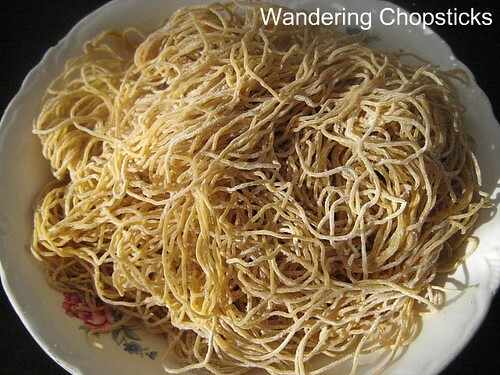 Break up the noodles and dig in! Who made my recipe for mi xao don thit bo? Kindra of Meal Planning 101 said, "Wonderful. Exactly like the restaurant's. Actually....probably better than the restaurant!" 1 year ago today, sauteed squash blossoms. I think chow mein is the Chinese term. I know "mein" means noodle... One trick my mom taught me was to add a bit of baking soda to the beef to ensure it's super tender. Yum! love how colourful this looks. And the crisp noodles must hv gone well with the sauce! I like the first version with beef, veggie and shitake mushroom as the colour and gravy looks really tasty. I know chow mein is Chinese. I meant I didn't know the name of the whole dish in Chinese. :) My mom uses baking soda if it's a tough piece of meat, but in general meat shouldn't be that tough. Just gotta remember to rinse thoroughly as baking soda makes things taste bitter. I love the combo of crispy and saucy noodles. You should try. It's very easy to do. 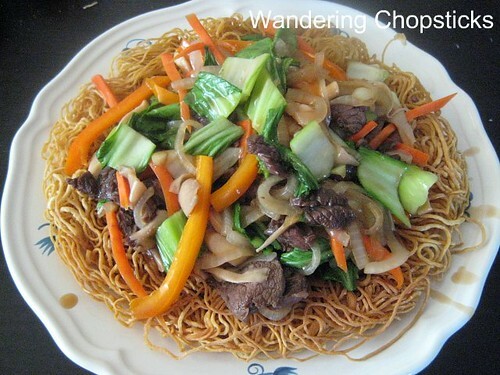 I made this following your recipe using beef, bok choy, and shiitake mushrooms. My friends loved it!!! Especially since it was my first real time cooking :D Thanks a lot!